Anyway, on with the post! I've realised that many of you wonderful people who read my blog are big on smells. I never noticed until I started doing my reviews, but I'm pretty big on smells too. So because you guys are so big on smells, I decided to publish a little review on all the fantastic fragrances I was sent recently, and really enjoyed. 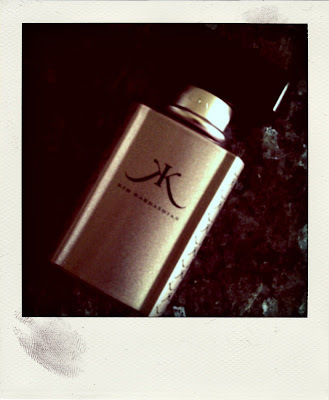 First up is the Kim Kardashian Eau de Parfum Spray. I was sent this perfume to try a few weeks ago, and I have been reaching for it every time I go out. This perfume isn't what I would normally wear - I'm more into delicate floral smells, but I find that this perfume is very long-lasting and pretty far-reaching (if you understand what I mean), which is why I love it so much. Kim Kardashian Eau de Parfum has a very musky base, mixed with a floral scent. The two strongest tones that I get in this perfume are sandalwood (the musky base) and jasmine. The best word I can use to describe this perfume is sensual (I'm not claiming that it makes sense, it's just my weird logic). If you're a fan of a very floral and musky smell, I definitely recommend this perfume. This lasts all night (and then some)! Kim Kardashian Eau de Parfum comes in a 10ml rollerball (AUD 22.95), and sprays in sizes 30ml (AUD 49), 50ml (AUD 69), and 100ml (AUD 89). Get yours at Perfume Connection, Myer, or Priceline, and selected pharmacies. Next up! The new Radox shower gels! I was also sent these for review purposes a few weeks ago, but I'm just going to share with you my favourites. The Radox Pomegranate & Rosehip Oil Shower Cream is my absolute favourite of the bunch! It has a lovely sweet, and yet not overpoweringly sweet smell. I LOVE using this in the mornings, because the smell lasts forever! It has that gorgeous fruity-floral smell that I love, and I am loving it! This is meant to be deeply hydrating, but I don't think it is enough to forgo body lotion, especially in this weather. 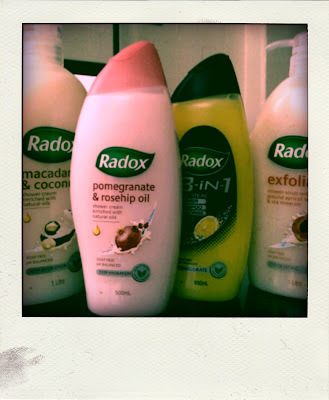 The Radox 3-in-1 For Men is my second favourite shower gel from this lot. Obviously, the boyfriend uses it, and the best part is that it is a shower gel, shampoo, and deodorant, all in one (hence its name). When you first use it, there is a very strong lemon scent, but that eventually disappears and what you get instead is a lovely masculine Cool Water-ish scent. The boyfriend really loves this shower gel as well - he was actually using a Radox product before this, so he was really glad to have something similar to use after he finished the first one. These products were released this month, and both retail at AUD 5.99 at supermarkets and pharmacies. 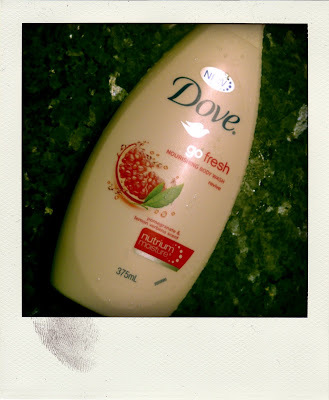 The final product that I have up for review today is the Dove Go Fresh Revive Nourishing Body Wash. This is extremely fruity and very sweet-smelling. It took a while for me to get used to it, but again, I'm loving the smell for morning showers because it stays with me throughout the day. Not to sound like an ad, but I love smelling all fruity and fresh in the mornings. This shower gel is features Dove's NutriumMoisture technology, which is meant to deeply nourish the skin. I have yet to see the effects of this (I've only been using it a couple of days so far), so when I have a better idea of whether it works or not, I'll post another review.